Change is in the air, and disrupting airline loyalty programs is coming from an unlikely source. Globally, airline loyalty programs generate billions of dollars in sales every year. They are the pinnacle of all loyalty programs, and they’re what every company dreams their loyalty program could be like- scalable, highly profitable, technology-driven, and with access to one of the most highly desirable rewards on the planet – free airline seats. With stable profit margins up to 45%, FFPs sell the dream that everyone can fly to luxury destinations for free, and best yet – airline loyalty programs sell something which physically doesn’t exist – airline miles. The metrics are so good, that in many cases – airline loyalty programs can be worth more than the actual airline itself. Airline loyalty programs fundamentally exist to serve a single purpose – to generate airline ticket sales and drive revenue back to the airline. When people get hooked on airline loyalty programs, they do crazy things. In extreme cases – taking extra discretionary flights to ensure they retain elite status. Airline Loyalty Programs sell THE DREAM – whether it’s connecting loved ones, or taking that aspirational holiday to Hawaii, Paris or the South Pacific. The ability for airline loyalty programs to sell THE DREAM, and in the process make their points currency irresistibly desirable – is nothing short of magic. In fact, for the better part of 20 years, airline loyalty programs have collectively enjoyed a near ‘industry monopoly’ on loyalty program success. There has never been a hint at any outsider disrupting airline loyalty businesses. Think about it – it’s a highly attractive currency, there are the glamour and romance of business and first class cabins in the sky — rewards that no other loyalty program can match. Airline loyalty programs sell the dream perfectly. Airline loyalty programs fundamentally deliver value to their members in a way which non-airline programs cannot. Even the latest Uber loyalty program doesn’t offer the type of value which airline loyalty can. The secret sauce is that airline points/miles allow members to aspire to a trip that they otherwise would never be able to afford or contemplate – such as flying First Class between New York and London. It is this aspiration which drives the irrational pursuit of the currency. The ‘trick’ to all of this working – is that the currency value is opaque. The minute that the currency is worth, say, 1c per point – all of the desirable aspirations evaporate, along with desired consumer behaviour. Airline loyalty programs are like giant dams of water. They’re powerful and hold a lot of valuable resources; but once a few cracks appear to begin to grow, there’s a rapid transition between holding the water in, and all hell breaking loose, the dam not being able to retain the revenue for the airline. A hidden crack appears every time a loyalty program devalues the currency, strips away benefits, or increases status requirements for members. I Don’t Get It, Why Are People Still Collecting SkyMiles? Each time the programs devalue or remove benefits for members, there is a small behavioural shift in a subset of the member base. Since the program changes rarely benefit any members (note: members who control their own airline ticket spending), it’s logical to assume that there can only ever be a negative impact regarding revenue from the above-mentioned subset. In reality – not many airlines are using data effectively, and this can lead to missed revenue opportunities, a $1B annual loss in ticket sales, or perhaps even being blind to what threats are looming ahead. Digging deep enough to notice the small behavioural impact on commercial decisions should be paramount for any business. Take a look for yourself and read an airline’s annual reports. It’s near impossible to decipher any financial loss from loyalty program devaluation – especially at a time when airlines are announcing record profits. 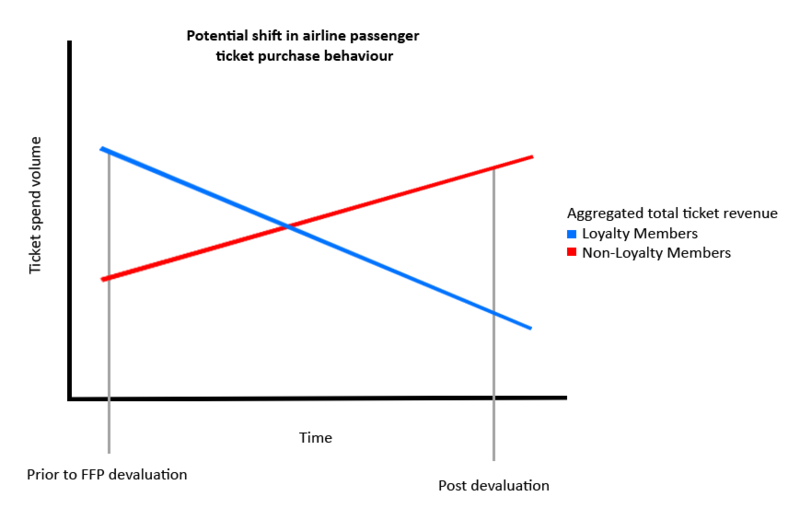 As the percentage of members who are value-driven loyalty members decreases, the overall airline revenue makeup slowly shifts towards a ‘price driven passengers’. 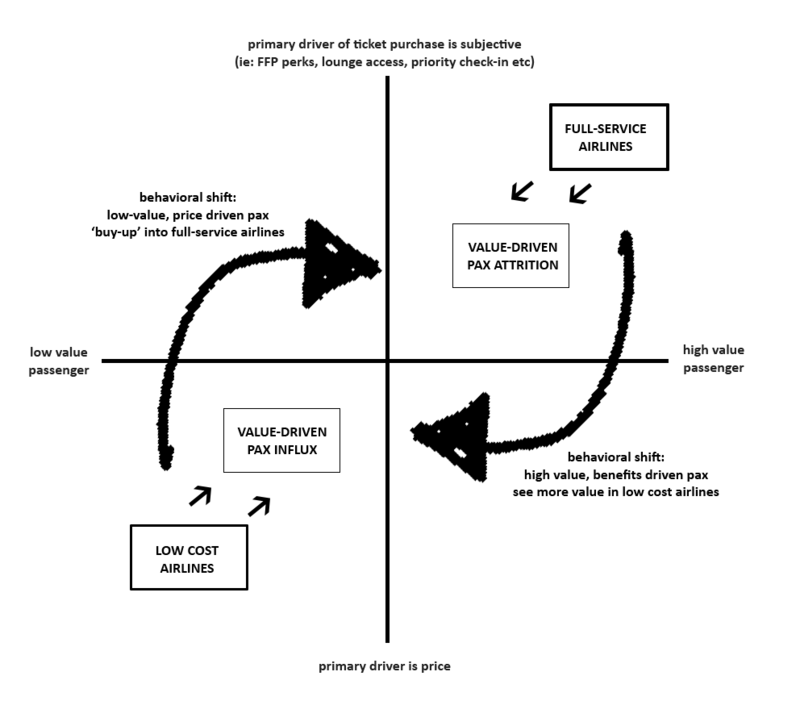 That is to say, the types of tickets, how that person will earn miles (if at all), how they choose to fly, and what they value in their flying experience, fundamentally changes from a value based transaction, (where that passenger is buying a ticket because of miles/lounges/priority check-in/upgrades), to a price-driven transaction by a passenger who no longer concerned with being rewarded for loyalty. Effectively the Airline is moving it’s loyalty member revenue base more into a space that every airline competes on – price. With the shift away from value-based rewards, this changes the dynamic and type of customer which is attracted to the loyalty program. The new type of loyalty member may now be more inclined to buy for a non-loyalty program reason – be that flight timing, airline lounges or the brand. Effectively, the loyalty member becomes less interested in the full-service program, and instead changes their behaviour to be more loyal to price – often shopping around based on cost, rather than paying a premium and remaining loyal as they had previously done. In this sense, the loyalty programs that partake in these devaluations are losing their foothold into the massive cash generation machines they’ve enjoyed for over 20 years – by pushing cashed up loyal members into the open arms of low and ultra-low-cost carriers. Full-service airlines rarely win on price compared to their competitors, and therefore we have a rise in low-cost airlines which are enjoying massive revenue from ancillaries. The increased wave in ancillary driven revenue from low-cost carriers is, in my opinion, driven by full-service carriers devaluing their programs to save cost, which in turn drives away the very type of passenger that underpins their loyalty program brand success. Low-cost airlines are cashing in on the trend, and the marketing campaigns reflect the audience which low-cost airlines are striving toward. Low-cost airlines are targeting the very loyal customer which full-service airlines are oblivious to that they’re alienating through destructive loyalty program changes. Even their marketing is skewed towards the premium segment. Where is the future of airline loyalty programs? Based on the current market – the disruption in airline loyalty won’t be from an outside force. There’s no revolutionary technology, no blockchain use case for airline loyalty, and there is certainly no ‘uber of airline loyalty’ to disrupt the industry. Low-cost airlines have a strategic advantage that this new type of traveller they’re acquiring wants to pay more. That traveller is used to paying full price and receiving all the perks. Imagine how insanely profitable a low-cost airline could be if they cracked the code on monetising their member base in a way which systematically creates a pipeline of premium customers which are transitioning away from ‘full-service loyalty’ and into ‘low-cost carrier loyalty’. 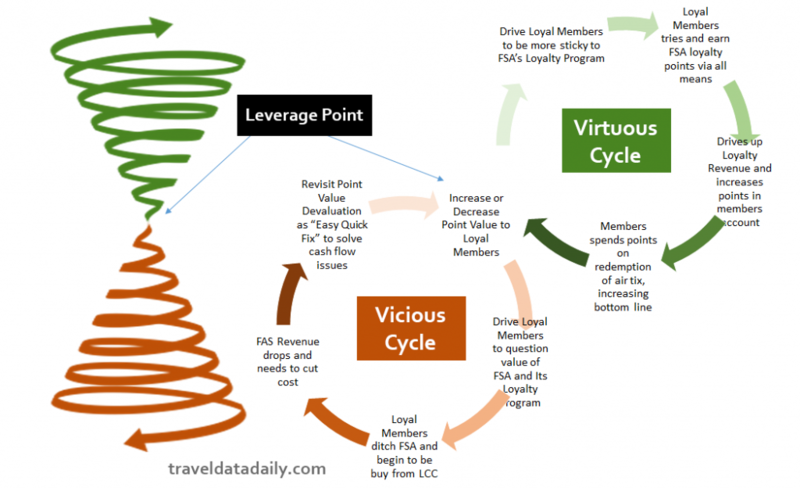 For low-cost airlines, it’s about taking a customer out of the ‘Virtuous Cycle’ of a full-service airline loyalty model and converting them into a ‘Vicious Cycle’ for the full-service airline. Once a premium traveller moves into the Vicious Cycle, it becomes difficult for the full-service loyalty program to win that customer back, and thus – revenue attrition. 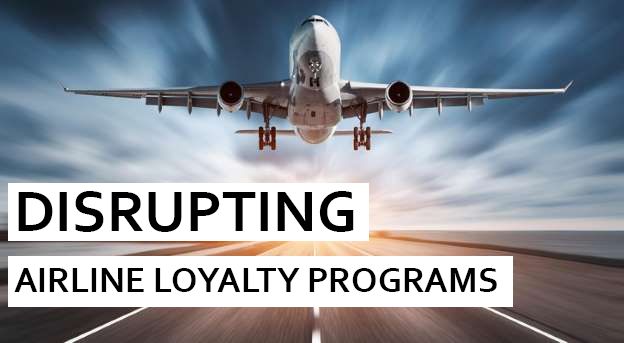 As more full-service airline loyalty programs strip away benefits, devalue the currency and make it more challenging to earn meaningful rewards, the cracks in the dam will continue to grow, more rapidly, until one day the game will be over and full-service airline loyalty programs, and their billions in revenues – begin to wash away. Downstream – there is a collective group of low-cost airlines ready and willing. Thirsty for new revenue. The future is ripe for low-cost airlines to capitalize on the influx of passengers who are willing to pay for the extra benefits, perks and recognition to which they have become accustomed from their travels with full-service carriers. It’s imperative that low-cost carriers don’t abandon the concept of loyalty, and carefully construct meaningful ways to recognise the new type of premium traveller which are dipping their toes in the LCC pond for the first time. Ultimately, the disruption of airline loyalty programs is coming from the airlines themselves. It’s their own inability to consistently deliver more value to the member today than they did a year ago, to recognise long-term loyalty members in small and yet meaningful ways. Loyalty program members see themselves as — loyal members. With that in mind – airline loyalty programs should always be about – the members. Legacy airlines need to take more proactive steps to invest in the loyal member base, which remains the single best way to improve passenger loyalty, increase yield, and protect the billions of revenue at stake that low-cost carriers are ready and waiting to catch.